This special edition color panel football was created in honor of the Denver Broncos victory in Super Bowl 50 and we are offering this unique collectible with a custom Bronco Champions Display Case marked at HALF PRICE! 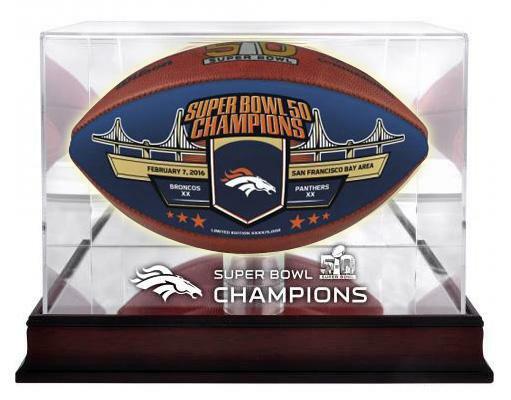 This ball is the same model as all the footballs used throughout the NFL regular season and playoffs, with the addition of a special Broncos navy blue and orange panel that features the score of the game and the Broncos logo under the inscription, "Super Bowl 50 Champions." 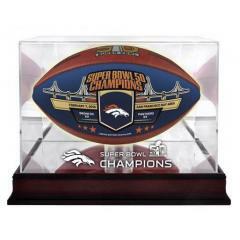 Your ball comes with a beautiful display case featuring a Mahogany base and clear, acrylic cover laser etched with the Broncos logo and the Super Bowl 50 Champions inscription. This sharp display case allows for 360-degree viewing of your new Championship Collectible Football and with a $50 Savings! Due to the limited release of this ball we must charge your credit card for the full price immediately upon taking your order. This policy ensures we reserve a ball and case set for you. We will confirm your order by Email. This ball is not game used.